We really would love to see your feminine side blossom with this challenge. This stamp is from Flonzcraft and is from the silhouette set. I think this stamp is soooo gorgeous! It is masked off and some hearts stenciled in to make it pretty. And framed her with some Maple Leaves. Added some layers, and some feminine touches with lace, bling and sparkle. Beautiful in pink Dot, you have designed this perfectly with the silhouette stamp. Totally delightful Dot and I really need that image, not sure how I missed it before as I love silhouettes. Hi Dot, beautiful stamping, love the foliage around that stunning focal image. The silhouette stamps are lovely aren't they? Delicious silhouette, and your layered framing elements are lovely! Beautiful stamp Dot and you have used it well. It is framed so nicely with all your embellies too. Thanks for joining in the fun at Crafting with Dragonflies and hope to see you back again! What a pretty silhouette image and fabulous card design. Oh so pretty in pink! I love that silhouette lady and her doggie! Beautiful and elegant layers! Hugs! 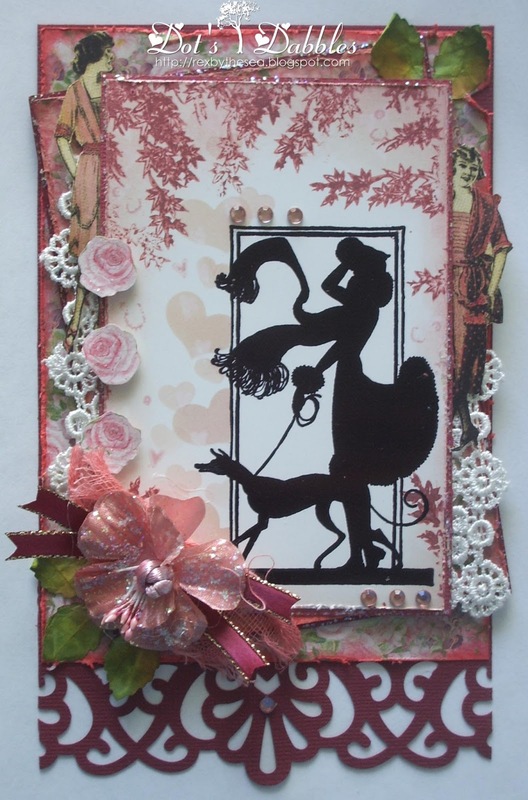 Such a fabulous card, love the silhouette image and all the fantastic details. Beautiful Design. Thank you for joining us at Artistic Inspirations.